The West Retford Hotel is a Grade II listed 18th century former Georgian Mansion house and stables. This magnificent large, three storey, former Manor House with two story symmetrical wings is built in a traditional Georgian style with red brick and stone string and the balanced windows in the main building are typical of the Georgian era. The project brief was to provide the hotel a traditional styled extension with a modern interior that could be a multi-functioning space. The room needed to be large enough for a large reception, but also small enough to have the perfect ambiance whether you are enjoying an intimate dinner for two or a larger family meal. 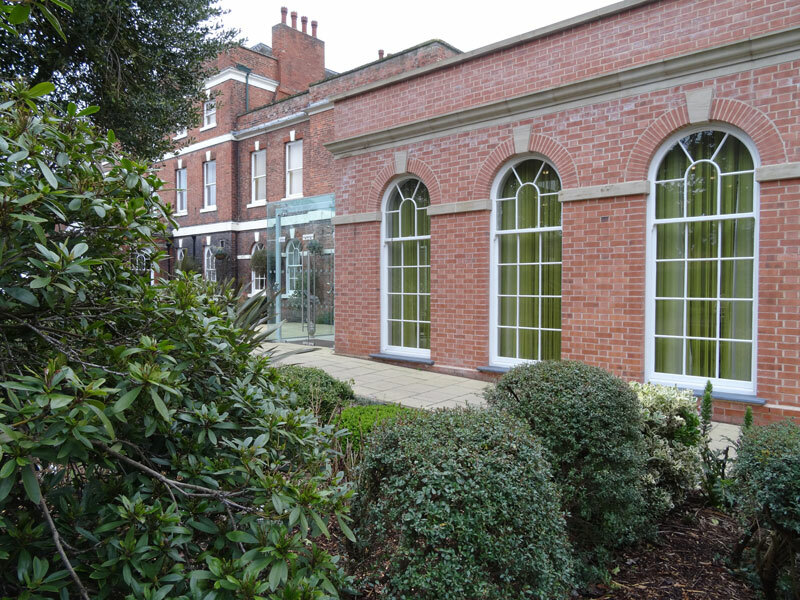 Soul Architects were appointed to design a new contemporary restaurant extension to this fine hotel. The new extension is in a very sensitive location between the main building and stable block. Designed in an orangery style the new restaurant has been carefully detailed to follow the architectural style of the historic Mansion House. 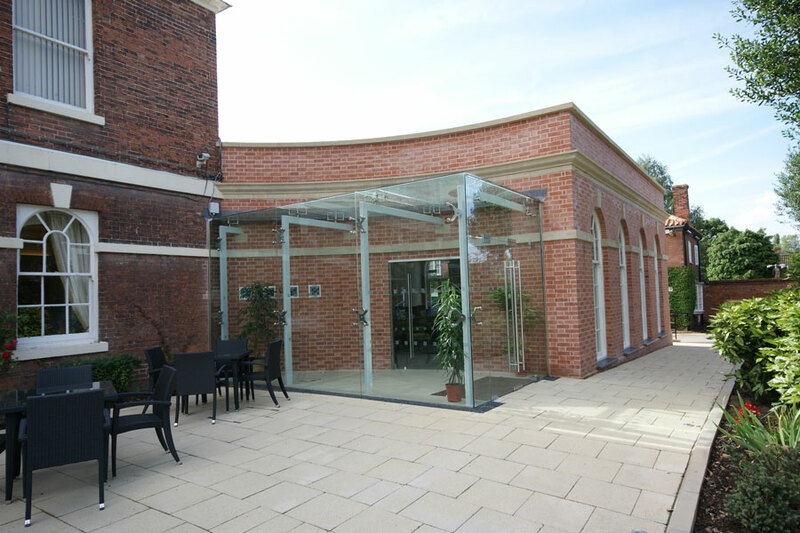 The new glass entrance is located within the curve of the original garden wall and provides a light contemporary touch that doesn’t compete with the main entrance. The restaurant extension has allowed the hotel to open daily to both residents and non-residents. The light, spacious room with its sophisticated style adds a touch of class, as well as its neutral décor adding flexibility. The new glass entrance provides a lobby as well as a separate entrance for non-residents. The frameless glass has a contemporary feel that doesn’t compete with the original hotel porch. The choice of furniture provides flexible seating arrangements, which will work not only as a restaurant but as a function room or conference facility. 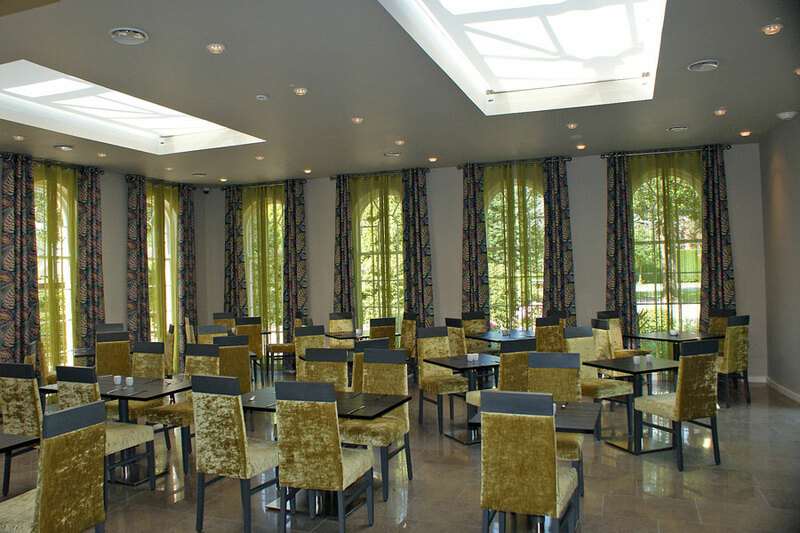 As well as natural light, mood lighting was added to allow the hotel to change the atmosphere depending on the event. A concealed AV System was incorporated into the design, with speakers in the ceiling and a ceiling mounted projector which allows the hotel to give presentations or hire the space for corporate events. Following the success of this project we have been asked to look at other areas to develop for the client as well as further projects at their other hotel, Aston Hall.